I figure it is time to dust the spider webs off this blog. I just returned from Shanghai. And I thought I would have had lots of good food there. I was wrong (sorry Charles, Erica, and Vivian). Honestly, the food was underwhelming. The quality of the better meals could have been just as easily found in Taipei. It is really cheap to eat in China, though. The labor is so cheap, now they just have to bring up the quality and the service. Overall, I ate little rice in China. Since the tabs were so cheap, we just ordered more dishes instead of having rice. I definitely sampled more variety this way. But the lack of rice also felt somewhat less satisfying, a feeling often expressed by Atkin's dieters. In Chinese, the phrase to convey "eat a meal" is equivalent to "eat rice." There must be some underlying explanation to this. Whether it is out of cultural habit or our human bodies' needs for complex carbohydrate, I just feel less wholesome without eating it. In fact, when I am cooking at home I always include a starch, pasta if not rice, couscous if not potatoes. Paranoid that the high-protein high-fat and low-carb diet in China messed up my system (or just plain jetlag), I am now eating as much rice, veggies, and fruits as possible. 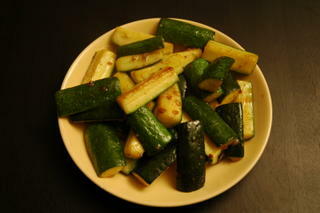 So last night, besides the leftover dishes I had, I cooked and ate all 3 big zucchinis. It feels good to eat veggies, but it was the butter that made it taste so good. 2. Heat butter, oil, pepper, and garlic in a pan over medium-high heat until sizzling and fragrant. Do not let garlic burn. 3. Add zucchini pieces. Toss every now and then. Add salt and sugar to taste. 4. Cook for about 3-4 minutes until tender but still crisp. Serve immediately. sorry to hear about the underwhelming food experience in shanghai. i haven't been back for over 3 years, so i don't know what tell ya. as my parents said, most of the traditional establishments (lao3 zi4 hao4) have been going downhill due to poor management and old chefs retiring/dying. there are so many new establishments everywhere. they pop up daily here and there, so unless you're a local, you really wouldn't know where to go. my advice is to just stick with flushing or pay a visit to vancouver next time for good cantonese food. when you're dealing with less choices (as the case in north america), you can identify the good ones more easily. Welcome back! I still think you needed a few good locals take you to restaurants where they know what dishes to order (don't ever take the advices from the servers, they just try to get you to order the most expensive ones). In my memory, HK still is the best city for food period. I went to Su1-zhe4-hui4 the first night, and it was pretty good. It just didn't "WOW" me. On the last day I went to this place inside a mall (Lane Crawford) with a name like 上海名家私房菜. That was actually pretty good. But at the price it was charging it should have been much better than the other places anyway. Still, it was cheaper than the US restaurants considering we ordered a bottle of wine and so many dishes. I also bought mooncake from BreadTalk. It's got some interesting flavors. But after a while they all taste similar. Starbucks in Shanghai were selling mooncakes too, which looked really yummy (chocolate and latte kind of flavors). Too bad they were all sold out. I still haven't been to HK except for flight connections. I'll probably go next time when I go back to Taiwan. 木瓜 is papaya. So You're basically talking about a smoothie made with papaya. first you'll have to find pretty ripe papaya. So far I've only had luck in NYC chinatown. Then you can play with different ratios of milk, papaya, and sugar/syrup. Papaya has a subtle flavor. A lot of commercial "papaya milk" has natural flavor added. I usually just like to eat papaya plain as a fruit...when it is ripe, it is soooooooooo good!